NZIP and Physikos 2019 Conference is Coming to Christchurch in April! 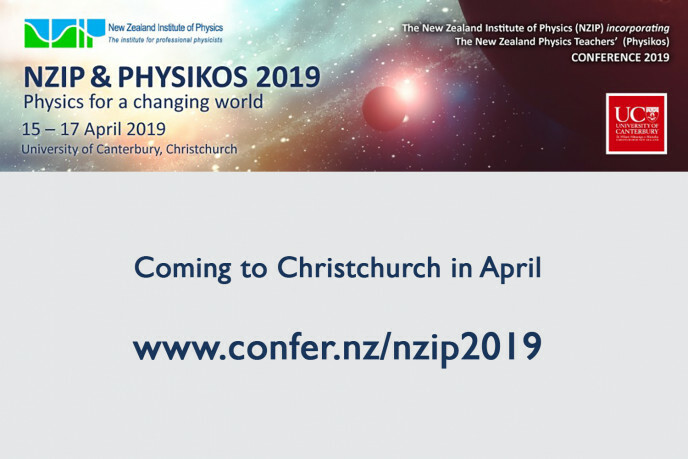 The 19th Conference of the New Zealand Institute of Physics, incorporating Physikos, the New Zealand Physics Teachers' Conference is coming to Christchurch from 15–17 April. The call for papers and registrations are now open! NZIP and Physikos is the 2019 professional development opportunity not to be missed for every physics educator and will be held at the brand new Ernest Rutherford building at Canterbury University’s Regional Science and Innovation Centre. The conference promises an exciting three-day programme with a great lineup of speakers on cutting-edge physics pedagogy and research, as well as public lectures and social functions. Our new teaching labs will be turned over to you to share demonstrations, displays, and posters. As part of Physikos, local and international educators will share their experiences and teaching strategies. Physikos is the major professional development opportunity for New Zealand Physics educators. Want to be part of the conference? We are looking for passionate people to present their cutting-edge physics pedagogy and research at the conference. Visit the Call for Papers section on our website www.confer.nz/nzip2019 for details how to get your presentation to NZIP 2019! Come to Canterbury to be inspired, so that you may inspire the generations that will shape our future! We look forward to seeing you in Christchurch in April!